An alien family are accidentally sucked into an NASA space probe which then returns along with its new cargo back to earth for examination. The aliens manage to escape capture but are separated from one of the younger members of their family, who is later befriended by a young boy in a wheel chair. When I was a kid I use to love this movie, but as a kid I would watch anything. I watched it unintentionally, I asked my mum if we could rent E.T., but the local video store’s copy was out. 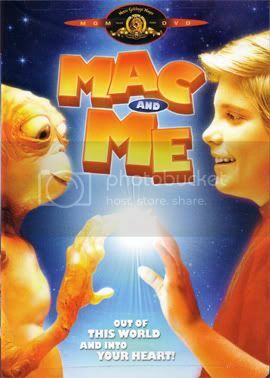 So the clerk there suggested Mac and Me. I remember she said something along the lines of “Rent Mac and Me, it’s just like E.T. and just as good. Nope, this is barley even a movie, it’s more like a 90 minute advertisement for Coca-Cola and McDonalds. The little alien’s name is Mac, a reference to the Big Mac. A friend and I watched this together recently after for the first time in since our childhood. We had a good laugh at it; we spent most of the movie pointing out when we ever saw a can of coke and how bizarre it was that these aliens can’t seem to get enough of it. Towards the end of the movie they wander into a supermarket and where did they go? straight over to the coke that’s where. So the plot is very similar to that of E.T., but it’s missing everything that made E.T the wonderful movie that it still is today. The acting is noting short of awful and as for the characters, I just didn’t care. After watching this movie I felt, like a can of coke. So at least the movie did do it’s job as an advertisement.